Stagecoach lines proliferated in Idaho after the Civil War, and the variety of stagecoach stops and the people who ran them was amazing. For instance, along the long and arduous road from Boise to Silver City (which is high in the mountains and now a ghost town), you would find the Democrat Station. This was a house between Dobson and Reynolds Creek that was started by a man who was a Democrat. Apparently he was the only one of that persuasion who owned a station along the road, so people would say, “We stopped at the Democrat’s house last night.” I imagine his political leanings started a lot of debates over the dinner table. The Share House was another well-known stop along this line. Charlie Share was a veteran stagecoach driver, and he drove the run from Boise to Silver City for many years, staring in 1874. At this time the company running the line was the Northwest Stage Line. After a few years, he retired from driving and started the Share Stage House along the way, and he and his wife ran it for 28 years. Later they moved to Nampa and opened a hotel (1906) which was also called The Share House. The Share Stage Stop was located on Charlie’s farm, which included a 25-acre orchard and 35 acres of timothy and alfalfa hay. In the mountain country, feed for animals was at a premium, as was fuel. Another stop was Record’s Station, known for good cooking. You could buy a “first-rate meal” there for ten bits—$1.25—in 1865, in gold dust if that was your currency. This was during the mining frenzy, and prices were high. At that time, you still had to cross the Snake River on a ferry “run by manpower,” as reported in the newspaper Owyhee Avalanche. Wages for workers at the stage stops in the 1880s was around $30 to $45 a month. The stage stops would put up travelers and feed their animals for a price. At the Share Stage Stop in 1888, a man paid $4 to have his eight mules “put to hay” and 75 cents for his dinner and his horse’s feed. Hostile Indians were a concern along the stage lines until the late 1870s. One of the drivers was killed on this run in 1878. Passengers in the late 1860s reported Indian troubles, and the stage stop owners had horses stolen and other problems up until the end of the Bannock War. “Road agents” or stagecoach robbers also played their part, especially during the height of the gold mining period. In 1868, a gang plagued the stage lines. The Blue Mountain Gang was eventually splintered and many of them caught. This area is rich in history and drama, and I loved researching it for my Ladies' Shooting Club series. Much of the information in this article comes from the book Sagebrush Post Offices, by Mildretta Adams. Other books I used in my research for the series include a reproduction of A Historical, Descriptive, and Commercial Directory of Owyhee County, Idaho (first published in 1898), and Ben Holladay the Stagecoach King, by J. V. Frederick. To celebrate old stagecoach stations, I am giving away a copy of my book The Blacksmith's Bravery, featuring a young woman determined to become a stagecoach driver. To enter, comment and leave your contact information. Choose a paperback or an e-book. Susan Page Davis is the author of more than forty published novels. A history major, she’s always interested in the past. She’s a two-time winner of the Inspirational Readers’ Choice Award, and also a winner of the Carol Award and the Will Rogers Medallion, and a finalist in the WILLA Awards and the More Than Magic Contest. Visit her website at: www.susanpagedavis.com . Thanks, Maxie! I'd love to be able to time travel to the Old West--IF I could come back! Loved this blog! Thanks for talking about the stagecoaches and the stops. Very interesting!! I would love to win a copy of your book. tscmshupe [at] pemtel [dot] net. It's a very interesting area and time period. Thanks, Sally! What an interesting article. I am not sure I would have wanted to ride a stagecoach, but maybe ran a station would have been ok. Thank you for the chance to win your book. I prefer print. Angela, nice to see you here. I think it might have been fun too--at least for a while. Of course, we wouldn't have all the modern conveniences. Always fascinated to read these sorts of accounts. Fills my writer mind with all kinds of creative ideas. I hope you're inspired to write a really fun story, Cindy! Thanks, Mary! Glad you stopped by today. You're welcome, Tamara. Glad you enjoyed it. The wages for stage stop workers sounds amazingly good for that time! I guess that was one of the perks of working in gold rush country! Your book, The Blacksmith's Bravery, sounds very interesting! I don't think I've ever read a book on quite that premise, a young woman wanting to be a stagecoach driver. I think it would be a fun read! Thanks, Bethany! I know they worked awfully hard back then to pave the way for us. Enjoyed the blog - stagecoaches bring back good childhood memories of watching the older western tv shows. Love to win one of your books - a print copy, please! Hi, Bonnie! I love the old shows too. It might be interesting to run a stagecoach stop. I'm sure you would get a variety of people passing through! Would love a paperback copy of your book. Thanks, Lisa! I love reading all the various posts on this blog myself, and glad we get such a broad look at history in such an enjoyable way. Thanks, Lorna. Researching the time period is half the fun. Hi Susan, loved your post and laughed at the Democrat Station. Then as now people take their politics seriously. I live close to an old stagecoach road and sometimes drive it when the freeway is backed up. Love it, Margaret! Imagine nowadays if we had the Republican Inn and the Green Party B&B to join the Democrat Station. We'd have to have an Independent Hotel too. This whole era fascinates me. When I read about the work these people did and the dangers they faced, I am in awe. From the descriptions I've read, it wasn't much fun to ride in a stage coach. I would think it would be quite challenging to drive one. I'm interested in knowing why the heroine of your book, The Blacksmith's Bravery, wants to be a stage coach driver. Thanks for giving me the chance to win the book and discover this. Well, I won't give that all away, but let's just say the job she had was looking shaky and she'd always had a yen for this. And yes, I do think driving a team of four or six was quite challenging. Susan, I read the "Ladies Shooting Club" series and it was fantastic! Enjoyed this blog! You're a great author. Thank you for sharing and please enter me in the giveaway. Thanks, Barbara. As I usually do, if the winner already has the book offered, I give him/her a chance to request an alternate one of my titles, all of which can be seen at www.susanpagedavis.com. This sounds just fascinating! I would love to win the book. Thanks for the giveaway! A lady stagecoach driver would be a mighty brave lady to me. I would love to read why she was so interested. Thanks for the chance to win a copy of the book. Hi, Kat. You're entered. You know, I thought it was a bit odd the publisher wanted the titles to focus on the heroes, and yet the cover pictures and main character were the heroines in this series. The oddities of the publishing world! I really enjoyed that information about stagecoachs. I have seen one at a Western museum but I didn't have all that information before. 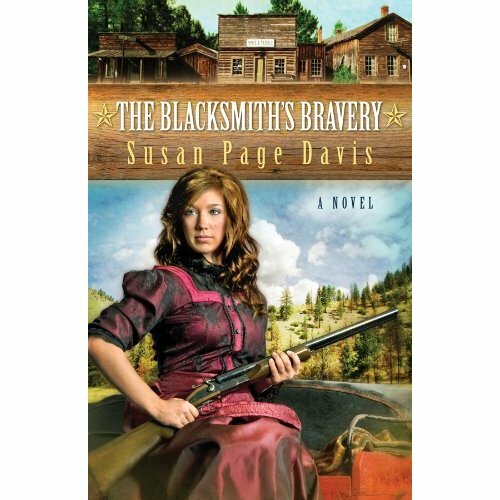 Thank you so much for the chance to win " The Blacksmith's Bravery". 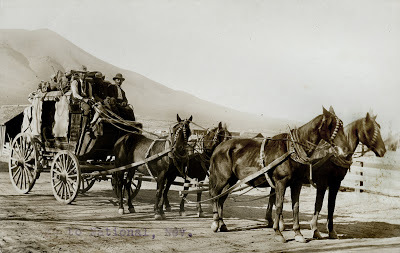 Women stagecoach drivers had to be intelligent and courageous! They sure did, Carol. There weren't many women drivers, but there are a few documented. It opens the door for some interesting stories, anyway. I think I saw too many Westerns growing up. I was always terrified by the thought of riding in a stagecoach! I think if real stagecoaches were robbed or wrecked as often as there were in movies and on TV, no one would have dared ride them. Overall, I think they were fairly safe. The routes were often chosen to avoid danger when possible. But yeah, I hear you. What an interesting sounding book, kind of like Calamity Jane, loved that movie, or Annie Oakly! Wendy, I enjoyed that movie, too--though I don't think the character as portrayed there was much like the real Calamity Jane! It was fun. I've never thought about the stagecoach driver and passengers needing to stop for the night. I guess I'm so spoiled by technology I figured they'd drive on through the night and sleep in the stagecoach. I am curious what it'd feel like to ride in one--it would have to be in moderate temperatures and probably for a very short time!! 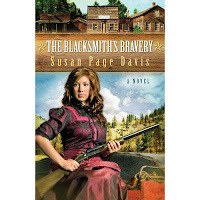 Thanks for the chance to win a copy of The Blacksmith's Bravery. A lot of times they did NOT stop for the night. They would change teams and maybe drivers, but often the passengers got only a few minutes to visit the "necessary" and at some stops to eat a meal. On some lines, home stations would let passengers get a room. A lot depended on the schedule of the stages and how long they had to wait for the next one if they were connecting for a different route. But usually I think you stayed with the same coach. If you had to ferry across a river, you might find a new coach and driver waiting for you on the other side, though. There was a lot of variety in the way things were run--whatever worked for those people at that time and place. I really enjoyed this blog as I was able to one-up my husband on his own state history. He has a home in Nampa also so again I told him some history. He currently lives with me in BC, Canada as he needs to remain here until we are able to bring children that we are adopting, to live in the states. I would love to visit the states as there is so much history there. I would love a paperback book but know the price could be high for shipping it here so would take an ebook. Helen, I actually stayed overnight in Nampa while researching this book, after my visit to Silver City. I love reading about stage coaches. I cannot imagine traveling that way and worrying about Indians attacking. What a privileged life we lead now! Great post! You're so right, Susan! We have it soft. I enjoyed learning more about stagecoach drivers and the routes. A woman driver would have to be courageous! Hi, Merry! I love reading about this time period too. I've written several books in which stagecoaches were very important, including this one, Captive Trail, Almost Arizona, and A Lady in the Making. I'm sure the stage driver's job has been romanticized, but I still love reading about them. And the winner of The Blacksmith's Bravery is...Cindy Huff! Congratulations, Cindy, and thank you everyone who took part. How did you find out about Record's Station? Which of the pictures are it? Sorry I didn't see this comment earlier. I believe I read about Record's Station in the book Sagebrush Post Offices, by Mildretta Adams. I came across this site today and was wondering if you had ever heard of a woman named Ella Lorena Smith (Dimmons) She ran a stage coach station in Boise in the late 1800's and met & married a Dimmons. Sorry, David, I had not. Fascinating people in that area! How about Ella Lorena Dunnigan? She married George Dunnigan while running the stagecoach station.